[Satnews] San Miguel (also known as Chaparrastique) is one of the most active volcanoes in El Salvador. On January 12, 2016, Moderate Resolution Imaging Spectroradiometer (MODIS) sensors on NASA’s Aqua and Terra satellites acquired these natural-color images of ash streaming from the mountain. Terra captured the upper image at 10:35 a.m. local time (16:35 Universal Time); Aqua captured the lower image at 1:35 p.m. local time (19:35 Universal Time). Winds transported the volcanic plume to the southwest. 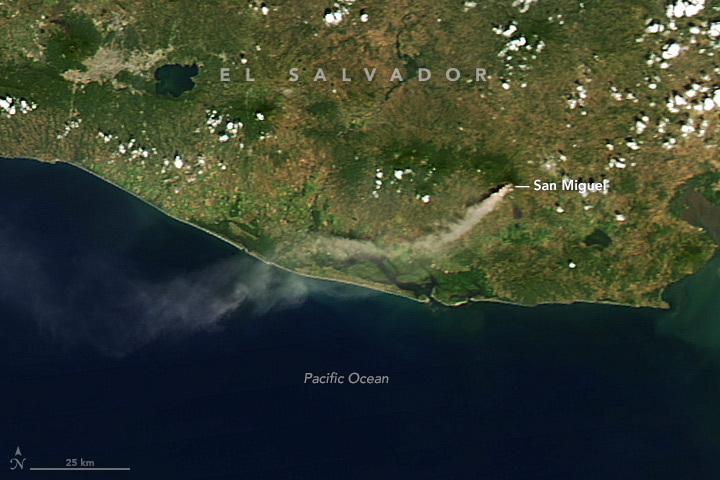 NASA Earth Observatory (2013, December 29) Blast from San Miguel Volcano. 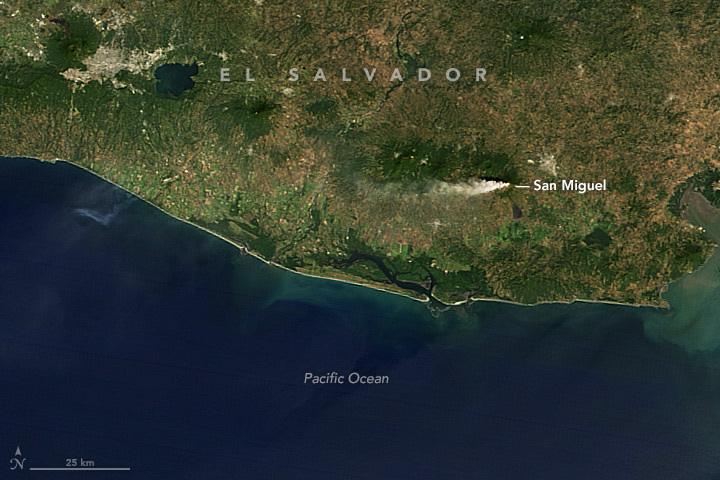 NASA Earth Observatory (2014, January 15) Fresh Ash on San Miguel Volcano. Smithsonian Institution, Global Volcanism Program (2015) San Miguel. Accessed January 13, 2016. Volcano Discovery (2016) San Miguel Volcano. Accessed January 13, 2016. NASA images by Jeff Schmaltz, LANCE/EOSDIS Rapid Response. Caption by Adam Voiland.